While out at dinner a few nights ago I had some really lovely garlic shrimp over rice. It was really tasty, but I am not a fan of rice unless it is my mother-in-laws fried rice, and I wondered how it would taste with pasta instead. So, a few nights later the inspiration bug was biting and I went to the market and got some shrimp so I could test my idea. What I wanted was a dish that was buttery with a mellow garlic note. I needed basil and the zest and juice of a lemon to brighten the flavor and cut the richness of the sauce. 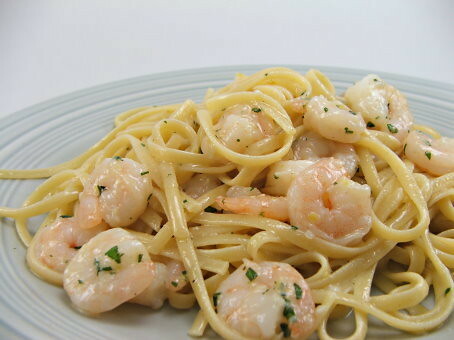 What I got was a flavorful dish with tender pink shrimp and perfectly cooked pasta coated in a delicate butter sauce with hints of garlic. 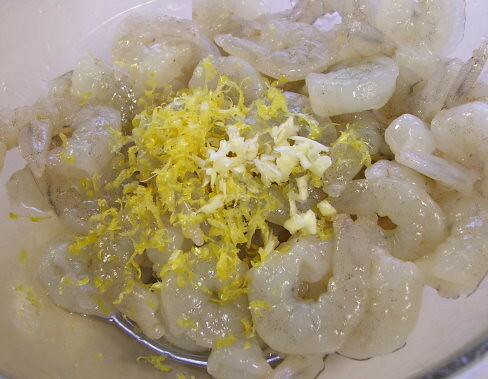 Place the shrimp in a bowl and add one teaspoon of garlic, the lemon zest and the vegetable oil. Stir and let marinate while the pasta cooks. Cook the pasta according to the package instructions, but cook for one minute less than instructed. During the last three minutes of the pasta cooking time heat the butter in a large skillet until it foams. Add the remaining garlic and saute until fragrant, about 30 seconds. Add the shrimp with the marinade and cook for 30 seconds, or until the shrimp are just turning pink. Add the basil and stir to combine. 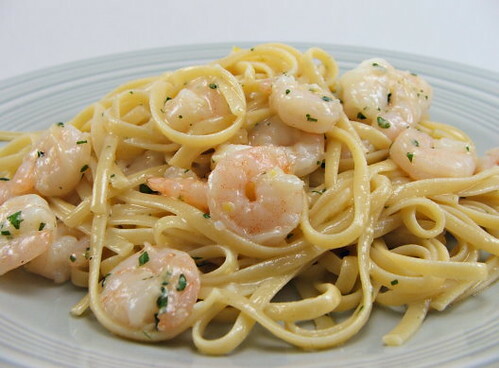 Reserve 1/4 cup of the cooking liquid, then drain the pasta and add it directly to the pan – work quickly or your shrimp will over cook. Stir to combine, allowing the shrimp and past to cook the rest of the way, about one minute more. If the sauce does not coat the pasta completely add a bit of the cooking liquid to thin it out. Top with grated parmesan and a spritz of lemon juice. Enjoy.